Nydri and the surrounding area of the Municipality of Ellomenos are located on the south-east side of Lefkada. It has many outstanding physical beauties, both on the coasts as well as the hinterland, which leave every visitor in awe. In this region the morphology of the earth varies. It combines the island's largest fertile plain, Englimenos, with the mountain ranges of Platystoma, Vakeris, Neochori, Alatros and Fternos, with the beaches and tourist resorts that are visited by thousands of holiday-makers. 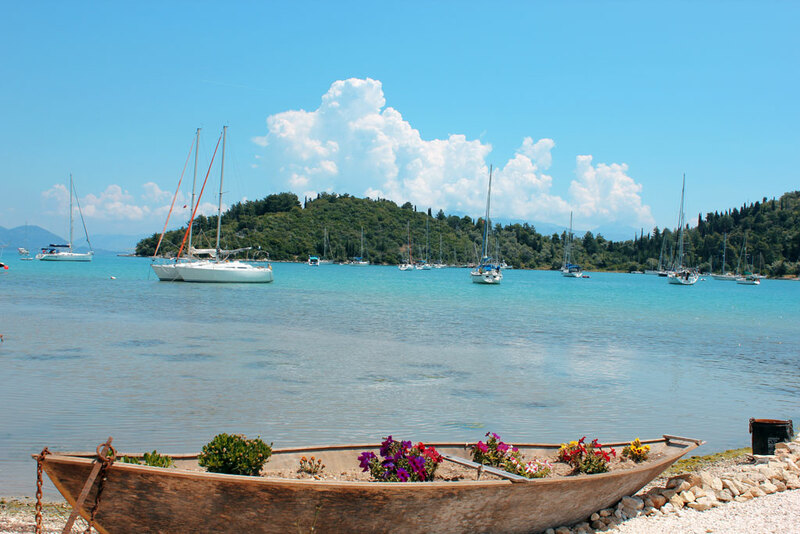 The large, leeward bay of Vlychos, which extends far into the dry land, constitutes an excellent natural harbour, hospitable to all the boats which sail in the waters of the Ionian Sea. The whole of the Vlychos peninsular is a luscious green which hugs the coast and reaches round as far as the opposite side from Nydri. It is as though the islands of the Prinkiponisa (Prince's Islands), which are small wooded islands, Skorpios, Skorpidi, Madouri, Sparti and, further away, Meganisi float upon the calm sea. And opposite, on the edge of the horizon, the coast of Akarnania on the Greek mainland, frames this unique and exquisite picture, a picture which differs during every hour of the day. A few years ago, Nydri and its surrounding area was nothing more than a small fishing community. Most of the inhabitants lived in small, semi-mountain villages located higher up, at Rachi, Vavkeri and Platystoma, and were involved in agriculture, live-stock rearing and fishing, as were all the villagers of the island. The rapid development of tourism gave the area a great push and won over the majority of the locals. Today, the place is very different from how it was in the past. In addition, the development of tourism also changed the demographic distribution. The residents moved from the interior mountain massifs to the coasts, where they became involved in tourism, at the same time continuing their winter agricultural occupations in the villages. The whole of the coastal zone from the village of Periyiali as far as Vlychos has merged into one compact area. There are dozens of luxury hotels and rented rooms, restaurants, shops and tourist offices which offer up-to-date tourism facilities, serving the most demanding visitor. The beautiful and immaculately clean sandy beach, which stretches out for kilometres ahead, provides bathers with the opportunity to try out all kinds of water sports. Even though the area is quite developed touristically, it has not lost its natural beauty. Thick vegetation with olive trees, pines and cypresses provide a framework for the carefully constructed tourist infrastructure. The orderliness and cleanliness help to maintain exceptionally civilised surroundings. The region's beauties are not just limited to its sandy beaches and to its cosmopolitan character, though it has many important historical, natural as well as cultural monuments to show, both along the coast and inland.